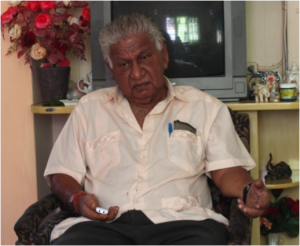 Siewnarine Singh Sharma, Trinidad: ‘Words that comes from the lips of my Sadgurudeva, never fail’. Words that comes from the lips of my Sadgurudeva, never fails; they will always come true. I comforted myself, remembering what He said to me at the airport, and I knew that Mama was taken care off. In my early days I was involved in Hinduism and this zeal propelled me to seek spiritual knowledge. My father had left us when I was very young, and we struggled with my mother who raised us with her love and protection. As fate would have it I got my first job as a clerk on the port of Port of Spain, ultimately becoming a Custom Broker. I became one of the first secretaries of the Sanatana Dharma Maha Sabha, the largest Hindu body in the island at that time. I was also an organizer for the Bharatha Seva Ashrama Sangha on their pilgrimages to Trinidad. In the early 1980s I organized and ran an Indian radio program ‘Dharma Prachar’ on one of the radio stations in Trinidad. In this program I tried to bring Hindu philosophical teaching and its music to the population at large. In those days many Swamis and Holy men would come and teach their ways. There were also many Hindu organizations, whose members were second, third and fourth generation Trinidadians. Our culture and traditions were being abused by those wishing to convert us into their ways, so I used this medium to help in fostering our true tradition and culture. I was also enrolled in Hindi classes at the Indian High Commission. Sometime in 1985, I was approached by two gentlemen, David Mukunda Balroop, and Randolph Forbes Chandrakate, who presented me with a long-playing record of a mystical Indian Swami. I was told that this musician swami has been visiting Trinidad since 1976 and there were some devotees who would like to hear His music. I took the record and played the music through every program. This was my first introduction to my Sadgurudeva Sri Sri Sri Ganapati Sachchidananda Swamiji. I was informed that in June of 1986 Sri Swamiji would be visiting Trinidad for about a month and many programs were planned across the island. After His arrival, Mr. Balroop invited me to join the organizing group to help with the transportation of Sri Swamiji’s assistants and the musical equipment. I embraced the opportunity and went to the place where He was staying; the home of the Indian Cultural Attaché, Sri Giresh Pandey, my Hindi teacher. On June 30th, 1986 was the first time I saw His Holiness in the physical form. His body radiated such magnetic charm that it was impossible for me to understand what was happening. The following day I was standing at the bottom of the stairs waiting for Sri Swamiji to come downstairs. One of His Holiness assistants went rushing up the stairs in a hurry as if there was some emergency. On his way up, he knocked over a table that was on top of the landing and he became very remorseful. He stopped and very carefully he set the table in its original position while bowing to it and asking for forgiveness then he went his way. I was dumbstruck at this incident and I wondered why he did what he did. With my curiosity I ask him about it and he explained that God exists in everything. He said that he had disturbed the table and therefore he had to apologize for his transgression; that God is omnipotent, omnipresent, and omniscient. I was awed by the cultural gap that we missed. I was engrossed in the programs that followed and stayed with the group. Sometime later we were to visit the home of the Ramdath family in Princes Town where Sri Swamiji will do a satsangha and give a discourse. On the way the group stopped at the home of an Indian Expatriate doctor so that Sri Swamiji could have His Bhiksha there. That Indian doctor had purchased some new equipment that would play both western and eastern VHS cassettes. Sri Swamiji handed the doctor a cassette that He had brought from India. The host tried to play the cassette, but every time he tried he failed. From the position where I was standing I saw Sri Swamiji watching the proceedings intently, from an open door. Then I heard Him said, “You people always asking Swamiji to bring cassettes for you, and now you cannot even play it, leave it alone Swamiji will fix it, watch”. I was amazed by this, how can a simple swami, a holy man, fix this piece of electronic without touching it? My thoughts were moving at the speed of light and my mind was grounded. Recollecting my thoughts I saw a movie playing on the television. I could not believe my eyes; He had really fixed the equipment. This was the most extraordinary event that I ever saw till that time. From there we journeyed to Princes Town where a lot of people had gathered for the program. Tents were set up in the open areas and there was not even standing room available. After the program Sri Swamiji was sitting on a chair with one leg crossed over the other; I was sitting a little distance away in front on Him. Looking directly at me, I noticed Him rubbing the sole of His Feet and He motioned for me to come nearer to Him, so very cautiously I crept forward. While I was moving forward I was hearing a cling-cling-cling sound. He had nothing in His hands and the clothes He was wearing did not allow anything to be hidden. But as I got within arms-length of Him He threw a large and heavy metal chain around my neck. People around me were astonished and one devotee actually made a comment that “He has gotten you now, you cannot escape from Him”. I was shellacked because I could not understand what was going on, over and over and over. How fortunate we are without even knowing it. Sri Swamiji formed the first Datta Yoga Center and I was installed as its secretary. He informed me that in all the organizations He would normally first go to the secretary for information. I took this to mean that I will forever be with Him; that I must help in His mission. All the other posts on the executive were filled by Him with Dr. Dianan Chandool as the president. I was also given the responsibility of procuring all the documents needed for His future trips to Trinidad. Although my name is Siewnarine Singh, Sri Swamiji calls me Siewnarayana Sharma. During the 1986 visit His Holiness called me and said, “Siewnarayana everybody in Trinidad has cars and homes. Swamiji too wants a home here, Swamiji wants at least one acre of land”. I called a childhood friend, Sri Ramesh Persad-Maharaj, whom I knew owned some property in the Orangefield area. These lands were unused rice paddies, but I thought with some work we could make this land buildable. I told Sri Ramesh that a Swamiji was here and He needed an acre of land. While speaking with him, Sri Swamiji was showing me two fingers, telling me He needed two acres instead. I relayed this to Sri Ramesh and he agreed. A short time later Sri Ramesh arrived at the house where we were and met privately with His Holiness for some time. Earlier, Sri Swamiji told us that when that man comes he will offer Him five acres. As predicted Sri Ramesh gave five acres of property to establish His Ashrama. Sri Swamiji went to the property and staked out an area Himself for the construction of the Dattatreya Temple. 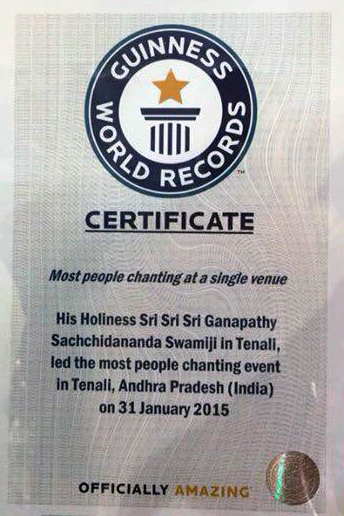 With the grace of Sri Swamiji the Temple was constructed within fourteen days and consecrated by His Holiness. He had both Pundit Boloji and me trained as the first priests for the Trinidad Ashrama. A large prayer hall was constructed adjacent to the Datta Temple and a two story structure was built as the residence for Sri Swamiji. The first floor was for His accommodation and the ground floor was for general use. During His visit in 1990 Sri Swamiji called me and said, “Siewnarayana, Swamiji wants you to occupy the ground floor, this is not a request, it is a command”. I stayed there for twenty years until it was torn down in 2010. After Guru, the next most important person in your life is your mother. My mother, ‘Mama’ was an ardent devotee of Sri Swamiji. Whenever He was in Trinidad she would help my wife, Rita, prepare meals and look after His assistants. However, Mama was silently suffering for many years with sarcoma, or bone cancer. As she did not want to upset her family, she kept this a secret and did not discuss it with anyone. But her illness was showing and I became very concerned. Later that year, when Sri Swamiji came to Trinidad, I went to the airport to receive Him. In the VIP lounge I sat at His Feet and started to relate the sufferings of Mama to Him. He sternly looked at me and said, “If something should happen to Mama while Swamiji is here, He does not want you to weep, He will take care of her”. That was all. Programs were proceeding unhindered and we were all having a joyous time. Then the time to pay homage to the Aripo River had arrived. Devotees look forward for this pilgrimage to be at this sacred place with Him. There He would offer His prayers to His previous incarnations and the multitude of deities that fill the area. Various forms of His existence will be seen by different devotees. Of particular interest to me was, the opportunity to collect bottles of the water that flows over His Feet and then swim in what fell into the lower pond. After the program, on my way back I went to Mama’s home. There were many people there who were complaining that she hadn’t eaten anything for the whole day. When she was told that I had come, she opened her eyes and was looking for me. I went to her bed and told her that Sri Swamiji had sent something for her. She looked at me with happiness in her eyes and I placed some of the water in her mouth. She drank the water, closed her eyes and was very relaxed. I sat there and sung some of Sri Swamiji’s bhajans to her and suddenly I heard a sound as if air was being forced out from a tire, and she breathed her last. Words that comes from the lips of my Sadgurudeva, never fails; they will always come true. I comforted myself, remembering what He said to me at the airport, and I knew that Mama was taken care off. In 2001, Sri Swamiji sent an e-mail advising all those who could make it to the Baton Rouge Temple in the USA should go there at a particular period. I called my good friend, Edward Bharath, who live in Orlando, Florida and made arrangements with a few others to join him and journeyed to Baton Rouge. We learnt that Sri Swamiji was traveling en route to the US when He met with an accident. He said that the effects of the accident were for several devotees who had to face calamities, and Sri Swamiji had to bear those effects. It so happened that on my way back I decided to extend my stay by one day to see a friend in Miami. In the early morning hours I received a telephone call from my wife informing me that our residence was gutted by fire that night and the fire started in the bedroom where I slept. I thank Sri Swamiji from the bottom of my heart, for if I had gone home as scheduled, to escape from that room would have been very difficult. In 2009 I visited the Mysore Ashrama and during my stay I was admiring all the developments that had taken place over the years. One day while I was walking I fell and received a cut on my head, and I was awed that this would happen to me. During a program, I went up to Sri Swamiji and was telling Him that I came all the way from Trinidad to meet with an accident here. His Holiness looked at me and casually remarked, “You did not come, it was Swamiji that dragged you here. If you had stayed in Trinidad you would have had a very severe accident, so I brought you here to prevent that”. In front of the crowd of about six hundred plus, I started crying uncontrollably. How benevolent is the grace of my Guru! When I left Mysore I visited the Bangalore Ashrama and was admiring the surroundings. I observed a spectacle as I had never seen or heard before. Hundreds of people were visiting the Karya Siddhi Hanuman Temple, obtaining coconuts and performing pujas, then tying these coconuts on the temple fence. After that they would join others doing pradakshina around the temples in a very organize manner. This went on from morning till night non-stop. I went to the bookshop and got a copy of a booklet filled with testimonials from people whose prayers were answered. I was amazed that people of different caste, class, and religions were simply following the dictates of Sri Swamiji. Fight the Devil, and Finish the game. Our samsara’s (tendencies) keep either pushing us into the past or pulling up to the future. Consequently, we miss the present which Is. If you are a scholar, you may suffer from scholarly pride and say, I am a big scholar. But who can be more knowing than God. God alone is all-knowing. Therefore, think that you are God, who is all-knowing as you are a part of Him and His splendor. Do not belittle yourself by saying that you are a scholar. Failure or loss of memory is mostly due to impure “Nadis”. By exercising proper check over the “Nadis” and keeping them trim and fit, supplemented by the practice of “asanas” suggested in the Yoga Shastras for the purpose, weakening or loss of memory can be prevented. Jaya guru datta Sharmaji.Thank you for sharing your experiences with Swamiji in this blog. Om Namo Hanumathe Namaha! Jai Guru Datta! Thankyou for sharing your story. Its really amazing and wonderful to read about our loving sadguru and how he has touched your life and your family’s life. Thank you! Lovely to read- Jai Guru Datta! Jaya Guru Datta .Thank you very much for sharing your experience . Mama is very furtunate soul .Om Namo Hanumatye Namaha.